When it comes to coffee professionals, few have the accolades and breadth of experience of Heather Perry. Ms. Perry is the Vice President and Director of Training and Consulting for Klatch Coffee, a 20 year old Los Angeles based coffee roaster and retailer with locations also in LAX and Asia. Ms. Perry began with Klatch Coffee working in the retail stores, and later began using her skills to complete in Barista Competitions. The skills she has learned at Klatch equipped her to win many titles including Four Time Regional Champion, Two-Time United States Champion, and taking 2nd place in the World Barista Championships to name a few. These titles helped to solidify Ms. Perry’s reputation as a professional trainer, and she has trained individuals and organizations in over a dozen countries. She is also the past Chair of the Barista Guild of America where she helped to design and launch their Certification Program. Ms. Perry has also used her vast industry knowledge in a consulting capacity. 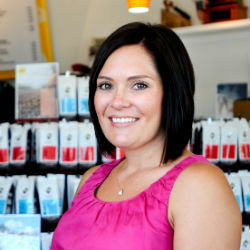 She has worked with many start up cafes and chains, developing their brand and practices from the ground up. She has also advised companies such as Marks, Breville, Got Milk, Kups, and Nestle. Ms. Perry is an industry leader and has been featured on such networks as OWN, Food TV, and Discovery. She has also featured in the LA Times, The New York Times, CNN, and Sunset and published in major trade magazines such as Barista Magazine and Fresh Cup to name a few. Ms. Perry is the current vice president of the Specialty Coffee Association and Co-Chair of the Professional Development Committee. She is a BGA Level 1 and 2 Credentialed Examiner and a Credentialed Lead Instructor for the SCA.